If you thought that Destiny 2 was going to replace the original anytime soon then think again. According to a new leak, Destiny will have at least 3 additional DLC's with "Comet: Plague of Darkness" and "Forge of Gods" rumoured titles. These will be in addition to The House of Wolves DLC that's also coming in 2015. The following article highlights all of the information contained in the DLC leak. We've seen leaks in the past that proved to be spot on but as always take these things with a grain of salt. Coming from an Italian source, the leaked information was taken from an official Bungie meeting (behind closed doors), not long after the original game was released. 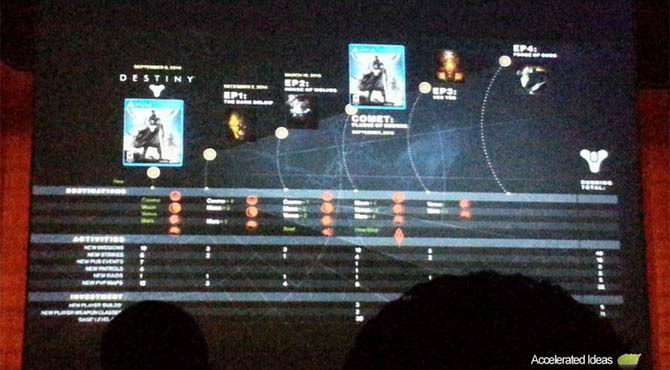 It shows a slide presentation for the future of Destiny, including a timeline for DLC packs and the items contained in those packs. We know all about The Dark Below and most of House of Wolves, but the interesting DLC's also planned are Comet, Vex and Forge of Gods. Let's take a look at each of those. Due for release after The House of Wolves, possibly in September, Comet will be a massive DLC release for Destiny. The leak suggests that Comet will be marketed on a disc and come with the full Destiny game and all previous DLC (TDB and HoW). Unlike other DLC's which contain a strike, raid and a handful of missions, Comet will be like a whole new chapter in the Destiny game. The mysterious 3rd subclass will be unlocked together with two new weapon types and a new base level for story missions. Strangely, there's a gap of 6 months between House of Wolves and Comet so there's a good chance that new Events will be released to fill the gap during those months. As the leak suggests, this DLC alone adds as much new content as the original Destiny game. We can consider this a Destiny 1.5 rather than a mere DLC expansion. The base level is upped to 30 to put it on par with the House of Wolves expansion and to keep the difficulty high enough. The new "Hive Ship" patrol area will be the first new patrol since the game launched back in September. To go with it there's a new Public Event type and a handsome collection of missions (12 in total) combined with 4 new strikes which will certainly include one on the new Hive Ship and the rest pinned to either Earth, Moon, Venus, Mars and possibly the Reef. There's no direct mention of Mercury but this may come in later expansions. Starting in the Comet DLC, the mysterious 3rd sub class will be unlocked for each of the character types. Hunters will get Void, Warlocks will get Arc and Titans will get Solar. 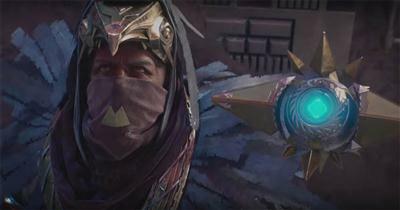 This will make the weekly Nightfall's a fairer experience and help balance the fight against different shield types. The leak doesn't mention any new exotic weapons or armour but you can be sure that they'll be a tonne of those in addition to new Raid gear to possibly reach Level 36. The vault size increase should come well before this DLC to give long standing Guardians a chance to stash their prized assets across all three characters. Players have long been asking for a new area to explore and the Comet DLC will provide the answers. There's a wealth of new content included that will surely keep Destiny ticking along until Destiny 2 appears on the radar. Unfortunately the leak doesn't provide a clear description for this DLC. We know that the first word is Vex but the second seems like "You" which makes little sense. However, the table area on the leaked image shows that the Vex DLC is a typical DLC pack relative in size to The Dark Below. A predicted release date for Vex would put it sometime around Dec 2015. This would be the last DLC of the year for Destiny. No mention of PvP maps but I'm sure they'll be a handful of those included as with TDB. Forge of the Gods is the last DLC pack from the leaked image. This would imply that come 2016, Destiny will be replaced by Destiny 2 rather than additional DLC packs. We've seen Fallen, Hive and Vex DLC so far so it's fair to say that Forge of Gods will be a Cabal expansion. Apart from the title there's little more we know about this expansion beyond speculation.